(1) LTP & Johnny Goodtime & Shane Hasts beat Charles Mercury & The Cutler Brothers and Los Luchas & Malachi Jackson in a nine-man, three-team tag match. This match was patterned after the Toryumon triangle tags. Fast paced match, with an exciting opening sequence that featured the heel team of Mercury and the Cutlers taking dives from the faces. Nobody really shined in this match besides the Cutlers. Solid opener that got fans hot. (2) Candice LeRae beat Christina Von Eerie: Von Eerie was making her debut at this show, and this match was the first women's match to take place in PWG since March 2008. Mostly brawling, with Von Eerie working a very stiff style. I would like to see Von Eerie return to PWG sometime in the future. Following this match a couple of members of the ring crew were asked to tighten the top rope, but instead tightened the bottom rope. Excalibur got on the mic and had to instruct them and cracked a joke. When they finished, Excalibur poked fun at the overweight one by saying "that'll do pig." (3) Scott Lost beat Human Tornado. Good match, with various comedy spots thrown in including some kung fu sequences during the match. Scott Lost picks up the victory with a Big Fat Kill (spinning back kick to the face) that looked really cool. Post-match, Tornado sold the kick really well by acting like he had no idea what happened. (4) Roderick Strong beat Karl Anderson: Good heavyweight style match. Several chop and strike exchanges in this that the crowd was really into. Both men used their finishing holds (Boston Crabs) on each other until Strong used a Strong Hold (Liontamer) to get the victory. (5) Naruki Doi beat Joey Ryan. Don't really remember much from this aside from Joey being really over with the crowd. Not a bad "clash of styles" type match, and the crowd heat helped it out. 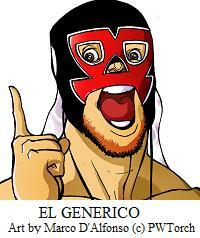 (6) Shingo Takagi beat El Generico. Following intermission, Generico and Takagi went on to have a great match with tons of dramatic nearfalls and false finishes. The fans in attendance were eating this up. Generico took a great beating, and the finish with Generico getting dropped on his head via a Last Falconry really got the crowd to react loudly. Possibly the loudest I've ever heard a PWG crowd up until this point. (7) CIMA & The Motor City Machineguns (Chris Sabin & Alex Shelley from TNA) beat Brian Kendrick & PWG tag champions The Young Bucks (Nick & Matt Jackson) in a six-man dream tag match. The Bucks continue to draw heat from the fans, and they have adapted well to the crowd rejecting them as of late. Lots of team work from both teams through out the match. CIMA got the pinfall on Kendrick, and after the match received a great ovation from the fans. 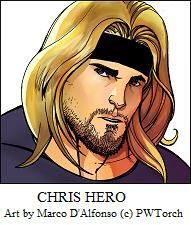 (8) Bryan Danielson beat PWG champion Chris Hero to become the new PWG World Champion. Danielson came out to a huge pop and was the crowd favorite. Great match, with Hero turning into a major heel during it by busting him open and screaming at him while he had submissions applied. Danielson would later make a comeback and submit Hero that resulted in the loudest ovation I've heard at a PWG crowd. Post-match saw a celebration with Paul London coming out to congratulate his Hybrid Dolphins partner. Danielson cut an emotional, humble promo and thanked the fans for their support. As various wrestlers came out to pay their respect, Danielson then vacated the PWG World Championship. Then he declared that a new PWG World Champion will be crowned at the 2009 Battle of Los Angeles. The match itself went about 45 minutes, was the epitome of an epic battle, and a possible MOTY candidate from any promotion. Great show. One of the best top to bottom cards PWG has ever put on. I highly recommend the DVD when it comes out. The last three matches really brought the show to a whole new level. Next show is October 2nd with the returning crowd favorites Kenny Omega and Chuck Taylor taking on The Young Bucks for the PWG World Tag Team Championship.